Peter Merholz reminds us the the dominant computer metaphor for the last 40 years has been the desktop, and it was Apple that brought that idea – files, documents, a trash can – to the masses. Since 1984, we’ve seen other metaphors come along. The Newton operated on a kind of notepad metaphor – or an electronic personal organizer and day planner. 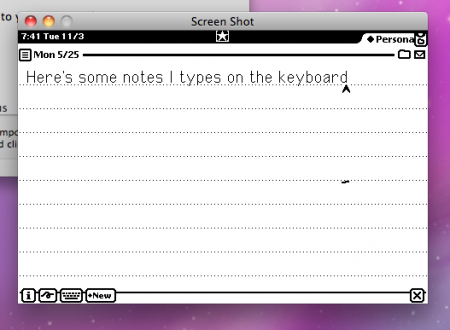 Now, OS X 10.7 Lion, by way of iOS, gives us another way to interact with our files and windows: Launchpad. 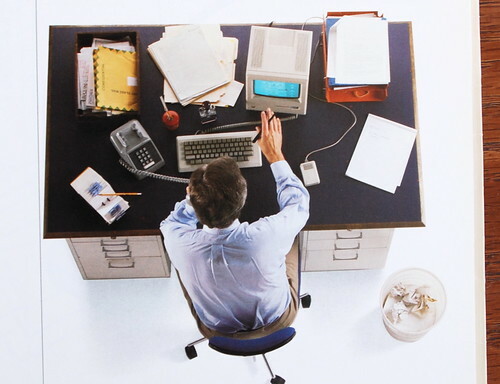 From there to here, the desktop has been a good transition metaphor. Take what people know (working in an office, dealing with folders) and put it on a screen. Now we’re getting more abstract as the PC industry matures, and as we add more functionality to our machines. Posted by davelawrence8 at 6:57 am on November 1st, 2010. No comments... » Categories: macs. Tags: desktop, file, folder, lion, mac, newton, OS X, PC. Subscribe via RSS. Here we see a great switcher message, and a kick-off to the “digital hub” strategy Steve Jobs laid out at Macworld the year before. Posted by davelawrence8 at 5:18 am on April 8th, 2010. One comment... » Categories: macs. 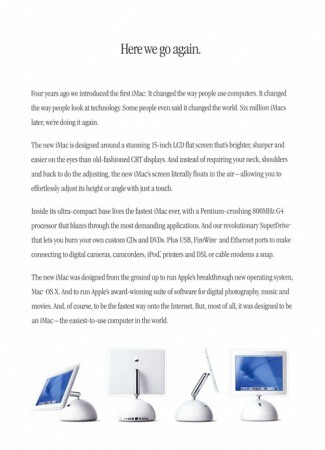 Tags: ad, apple, imac, imac g4, macintosh, OS X, steve jobs, wired. Subscribe via RSS. 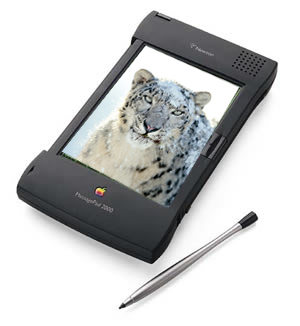 Newton users may wonder, with the release of Mac OS X 10.6 Snow Leopard, whether their MessagePads and eMates would still play nice with the new operating system. 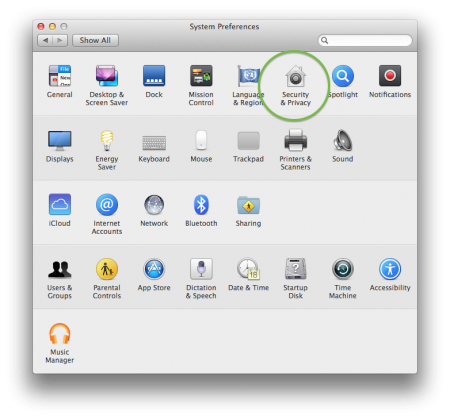 You get a new Mac (as I did) with the latest install, and you might worry – is it going to work? I’m here to report: everything works fine. I started by download the Keyspan USA-28x driver to my new iMac for the serial-to-USB adapter. 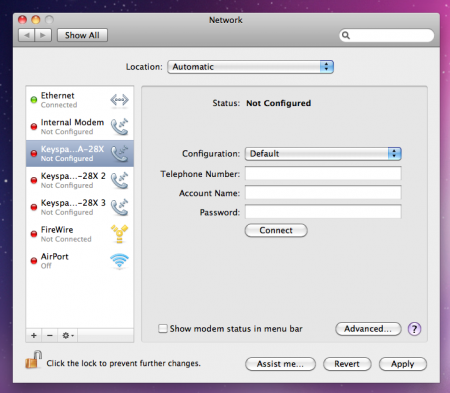 Things got weird when Snow Leopard recognized the Keyspan adapter as some sort of dial-up device (above). This wasn’t the case, obviously, but I pressed on just to see if it would work. 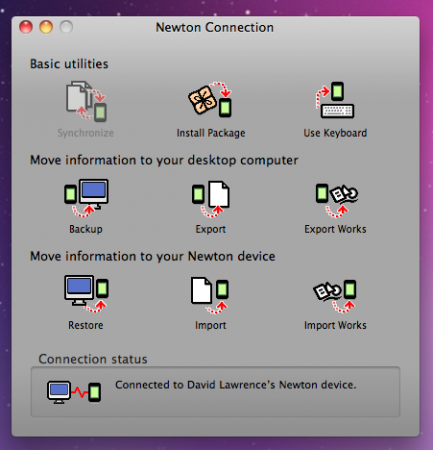 I went with Simon Bell’s excellent Newton Connection for Mac OS X (NCX) for the software connection, using a Newton eMate 300. Since I’m working through the serial connection via USB, I select “serial” in the Newton’s Dock app and – whala. NCX and the Keyspan adapter give me a connection on Snow Leopard. First, I wanted to try the new screen shot function on NCX – something that was only possible before in a few roundabout ways, like with Newton Toolkit. 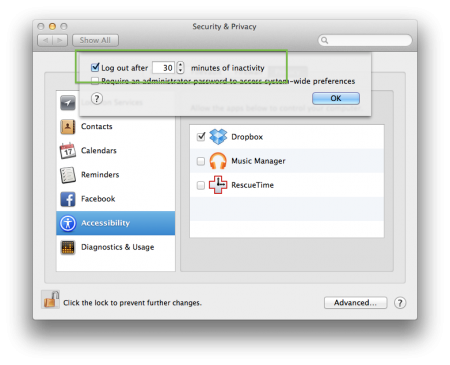 In NCX, head to File > Screen Shot, then press the little camera (above) and wait a few seconds. And bam, you get a little window pop-up with a screen shot of your Newton. Pretty handy. Next, I tried doing what every Newton user does at some point: install a package file. In this case, I picked a periodic table app from UNNA. This worked exactly as before. So everything, from the screen shots to the keyboard function – which, for me, worked faster than on previous Macs – works great with OS X 10.6. The real test, and the one I’ve had issues with on my eMate since forever, is syncing Address Book and iCal names and dates to the Newton. I’ve had no luck at all so far, besides a few to-do items syncing from iCal to the Newton’s Dates app, and I don’t guess it’ll get much better on Snow Leopard. 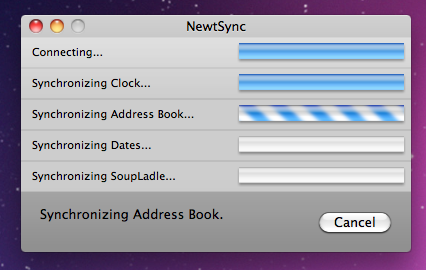 I tried using NewtSync (above), but had no luck syncing anything. 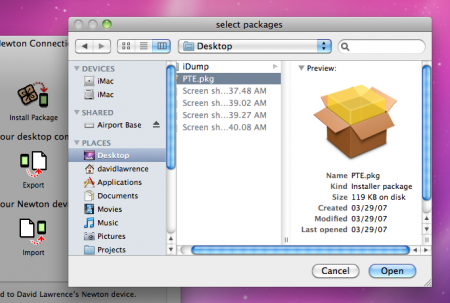 The important message to take away is that, with software like NCX, it’s possible to connect your Newton, install packages, and do a few other tasks no matter which version of Mac OS X you’re using. This may not always be the case. There could be some future OS X release that cripples any potential Newton-to-Mac connection. I would think it’d be in the areas of data syncing or unavailable drivers for serial adapters. But the newer MessagePads and eMates allow for Bluetooth compatibility, which shows no sign of going away. Posted by davelawrence8 at 5:45 am on November 5th, 2009. 12 comments... » Categories: eMate, howto, macs, newton, software. Tags: apple, imac, mac, messagepad, ncx, newton, OS X, snow leopard, sync. Subscribe via RSS. 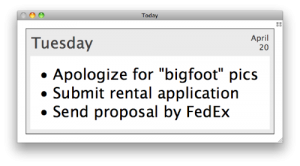 It was modified September 15, 2009 – the same day my giant discussion on the broken-ness of the iTunes 9 mini player and OS X’s zoom button inconsistencies appeared. Coincidence? Enough people bitching about it? Who knows. But Apple must’ve realized that some iTunes users were unhappy about the mini player change – enough so that they wrote the shortest support article I’ve ever seen at support.apple.com. Posted by davelawrence8 at 7:37 pm on September 17th, 2009. No comments... » Categories: itunes. Tags: green, itunes 9, mac, mini player, OS X, zoom. Subscribe via RSS.